Dr.N.G.P Arts and Science College, Coimbatore has advertised in THE HINDU newspaper for the recruitment of Principal / COE jobs vacancies. Interested and eligible job aspirants are requested to apply immediately from 1st November 2017. Check out further more details below. About College: This institution was established with the permission of the Government of Tamil Nadu as per G.O. MS No. 464, dt 27/08/1997, affiliated to Bharathiar University in its letter No.11129/A1/97 dt 17/10/1997 and recognized by UGC , New Delhi under 2 (f) and 12 (B) , Vide No. F.8-50/2003 (CPPi) dt June 2003. This is a self financed and coeducational college with a motto Nurture , Grow and Prosper. How to Apply: Interested and eligible candidates are required to send their applications along with their CV, copies of degree certificates / mark sheets and a color passport size photo attached with resume to the email address mentioned below. 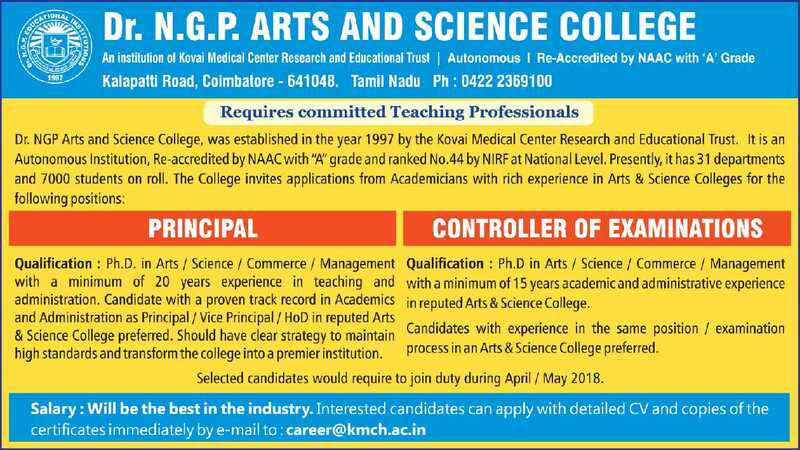 Reference: Advertisement on THE HINDU newspaper dated 01st November 2017.